Americans believe that both Islamic Extremists and White Supremacists represent a threat to national security. Although other types of extremist groups are a concern to large groups of Americans, only these two were identified by a majority of survey respondents. Differences between groups on which group represents the greatest threat reflects the political divisions we see in America on other issues. Fear of specific groups is influenced by knowledge of them, of course, in turn reflecting media effects. In the table below, we list the percent of Americans who responded that they had never heard of these groups. Although the trend isn’t perfect, as a general rule, Americans are more afraid of extremist groups that have been discussed in the media. 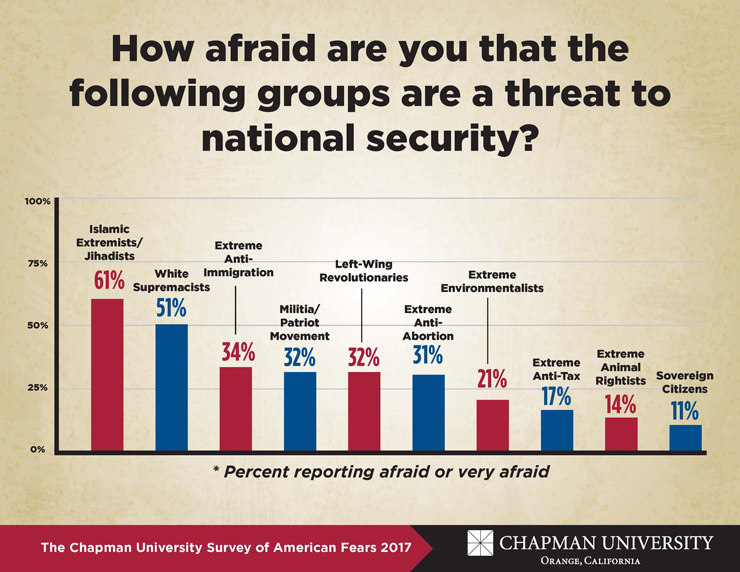 Three out of five Americans report they are very afraid or afraid that Islamic Extremists/Jihadists are a threat to national security. 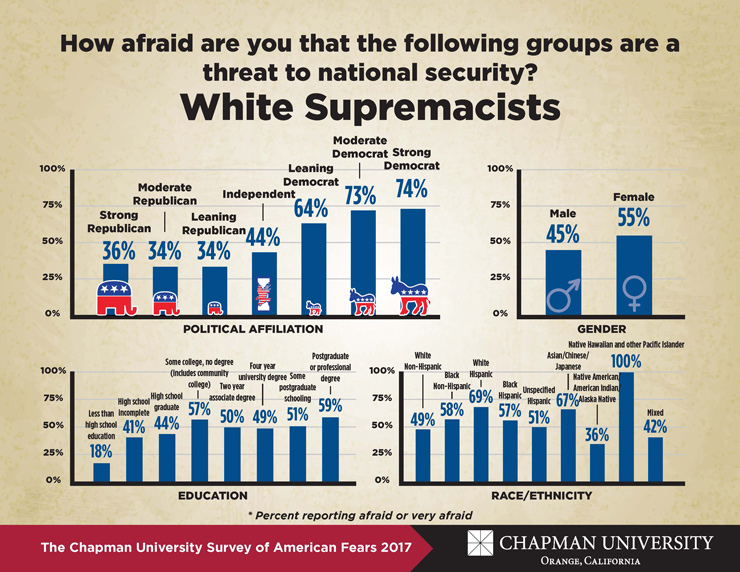 After Islamic Extremists/Jihadists, White Supremacists are the only group that a majority of Americans view as a threat to national security (51%). Roughly one-third of Americans identify the following four as threats: Extreme Anti-Immigration groups, the Militia/Patriot Movement, Left-Wing Revolutionaries, and Extreme Anti-Abortion groups. One in five Americans is afraid Extreme Environmentalists are a threat. Although a majority of Americans see both Islamic Extremists and White Supremacists as threats to national security, there are group differences. Republicans are more likely to view Islamic Extremists as a threat (83% of Strong Republicans, 53% of Independents, 42% of Strong Democrats) while Democrats are more concerned with White Supremacists (36% of Strong Republicans, 44% of Independents, 74% of Democrats). 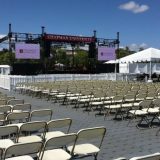 Education is associated with fearing White Supremacists as a threat (only 18% of those with less than a high school education identify White Supremacists) but not Islamic Extremism. 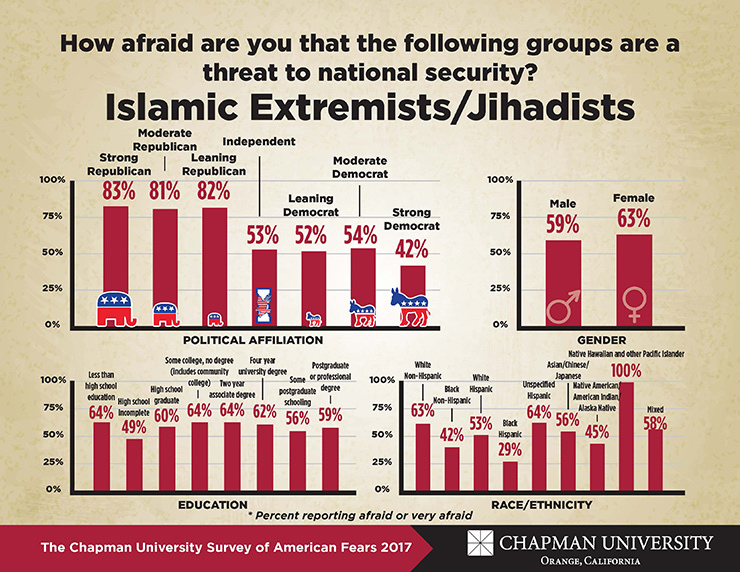 A majority of all educational groups believe Islamic Extremism is a threat. A majority of female respondents identify both groups as national security threats. And while a majority of male respondents identify Islamic Extremists as threatening, only 45% believe the same of White Supremacists. Whites are more likely to say Islamic Extremists represented a threat, non-whites are more likely to identify White Supremacists. The questions about which extremists are viewed as national security threats seem to be a proxy of sorts for the broad polarization that currently characterizes our country. Fear of these groups stems from their association with violence and acts of terrorism. This fear affects the daily lives of Americans and even leads some to question the value of American freedom. 29% of Americans reports being very afraid or afraid of being a victim of hate crime. One-third agree or strongly agree with the statement, “In order to curb terrorism in this country, it will be necessary to give up some civil liberties.” Even more, 35%, disagree or strongly disagree with the statement, “We should preserve our freedoms even if it increases the risk of terrorism.” As has been seen before, elevated fears over national security can lead to lower support for national values. The political and demographic differences over which groups threaten our security illustrate the different lenses with which Americans view the world, and these have important policy implications. The Department of Homeland Security is currently deciding whether to focus their countering violent extremism (CVE) initiative on a broad-based effort directed at various types of extremism or on a more narrow effort directed primarily at Islamic Extremism as has been suggested by the President. These data show that the majority of all Americans believe the threat is multi-dimensional, and a policy that addressed the concerns of all Americans, rather than those of specific groups, would focus on the broad-based approach.